Unlike shares or bonds, the performance of a currency cannot be viewed in isolation but must be analysed in comparison to another currency. In fact, very different results emerge when comparing the performance of sterling against the euro or the US Dollar. In recent weeks, while on the one hand sterling hit a five-year low against the US Dollar, on the other hand, it traded at a 7-year high against the euro. For Maltese investors, the sterling vs euro exchange rate is naturally of more significance than the performance of the pound vs the US Dollar. Those involved in the tourism industry would be pleased at the recent outcome of a strengthening sterling against euro, since UK nationals find it cheaper to travel to EU destinations such as Malta. On the other hand, imports from the UK have become more expensive and importers may need to factor this into their costings since they may not be able to pass on the full extent of the higher costs arising from the currency difference onto consumers. One sector that ought to have been significantly impacted by this outcome is the importation of motor vehicles. While imports of second hand cars boomed from late 2008 onwards as sterling weakened, the strengthening of the pound over recent months ought to have negatively affected importers of second hand vehicles from the UK since the attractiveness may have diminished due to the impact of the currency on the costings of the imported car. Meanwhile, new car importers may have benefited from this outcome. Given these various factors at play for both Maltese investors and consumers, this article will touch upon the recent performance and outlook of sterling against the euro exchange rate rather than against the US Dollar. 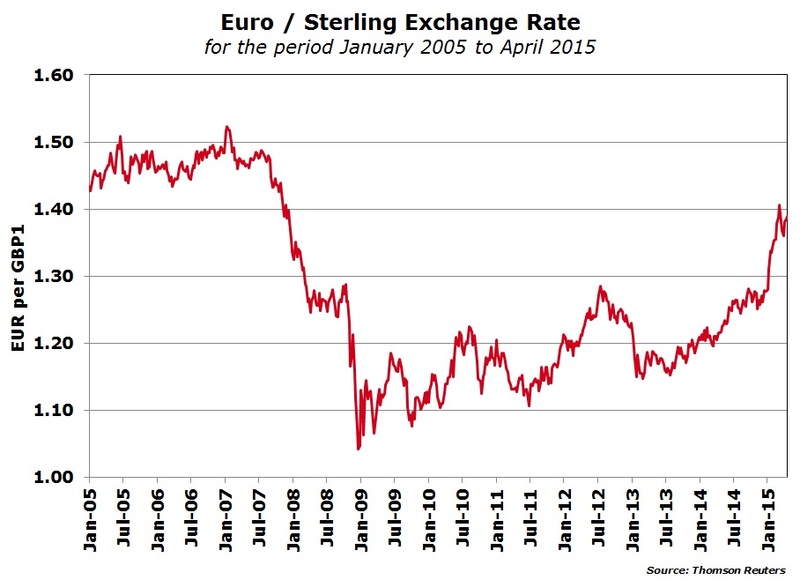 The 10-year chart of sterling when compared to the euro shows the increased volatility over recent years. Sterling had weakened significantly at the start of the financial crisis in 2008 and had reached almost parity against the euro in December 2008. The value of the British pound recovered slightly afterwards but remained weak in comparison to its historical average. In fact, as the chart indicates, despite the 13.6% rally in sterling since the end of 2012, the value of the British pound is still 8.7% below the peak of €1.52 reached in January 2007. Apart from the normal economic factors at play which generally impact exchange rates, the upcoming general election in the UK taking place on 7 May, which is the most unpredictable in many years, is also possibly playing its part on currency movements from one week to the next. The polls currently indicate that support for the two main political parties in the UK (the Conservatives led by the current Prime Minister David Cameron and Ed Miliband’s Labour party) is very close and neither party is likely to secure a majority. The election outcome is therefore a very close call and there is a growing danger of a hung parliament with neither Labour nor the Conservatives (also referred to as the Tories) winning an overall majority and both possibly also struggling to replicate a coalition government similar to the one of the past five years. The biggest risk to further sterling strength is the election of a Conservative-led government since there is a very strong chance that a referendum on the UK’s continuing membership of the EU will be held next year or in 2017. The strategy of the Conservative Party centres around renegotiating the UK’s relationship with the EU across 5 key areas prior to a referendum taking place. The Labour party does not envisage the possibility of a referendum and therefore there is a lower likelihood that Britain can exit the EU. However, a future Labour-led government is set to pursue looser fiscal policy which could lead to a higher deficit and possibly a weakening credit rating. This could also lead to a negative impact on sterling going forward. Apart from the above, the future role of Scotland could also be another factor irrespective of the outcome of the election and this could also lead to negative sentiment towards sterling in the future. Volatility is therefore expected to intensify in the weeks ahead due to the uncertain outcome of the general election. Once the results are confirmed, more clarity is expected on the implications for sterling although a hung parliament can lead to an extended period of political uncertainty and thus currency volatility. Continued sterling strength against the euro is more unlikely if a Conservative-led coalition is formed, mainly due to the referendum on EU membership. Moreover, the recent publication of economic data showing a slower rate of growth in the UK economy coupled with indications from the Bank of England of a delay in interest rate hikes could also cloud positive sentiment towards sterling in the immediate future. However, many international currency strategists believe that the recent strength of sterling vs the euro is being driven much more by factors across the EU, particularly slow growth, monetary easing in Europe and the Greek debt negotiations, rather than specific UK issues such as the high degree of political uncertainty and economic data emerging from the UK. Both economically and in terms of prospects for interest rate changes, the eurozone is out of sync with Britain. The economic performance of the eurozone is still very weak indeed and last month’s launch of the quantitative easing programme by the European Central Bank is one of the major factors which led to the renewed weakness of the euro during the first few months of 2015 against most currencies including sterling. Additionally, the continued uncertain outcome of negotiations with Greece and news from the European Central Bank on the success of the QE programme will probably be among the main catalysts behind future exchange rate movements. Any indication of an improving inflation outlook coupled with possible talk of an earlier end to the QE programme before September 2016 could lead to a partial reversal of the recent trend and a strengthening of the euro in the months ahead. Maltese investors should therefore become more accustomed to increased foreign exchange volatility. This was also evident in the aftermath of the shock decision in January by the Swiss National Bank which led to an initial 30% decline in the value of the swiss franc within minutes of the announcement. The immediate outlook for the euro against sterling is clouded with uncertainty on the outcome of the UK general election but more importantly by the fluid situation across the eurozone. Investors should therefore adopt a degree of caution when considering investment opportunities in non-euro currencies since as a result of the increased volatility across currency markets, this could have a large bearing on the performance of one’s investment portfolio.